Holly Yaryan Hall is a licensed professional engineer with 14 years of experience as a civil, hydraulic, and water resources engineer in the private and public sectors. She holds degrees from Princeton University, Colorado State University, and the University of South Carolina, and she has completed levels I through III of Rosgen training. 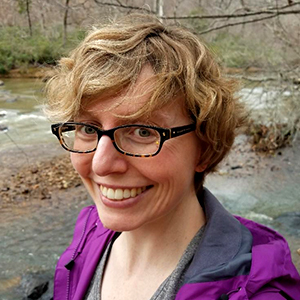 Prior to pursuing a Ph.D. with Dr. Brian Bledsoe at the University of Georgia, Holly served as a senior member of the Water Resources Engineering team at EMH&T, where she consulted on a variety of stream restoration, floodplain, transportation, and stormwater projects. She worked with the Ohio Department of Transportation for 9 years, beginning with district in-house design and later joining the ODOT Office of Hydraulic Engineering, where her responsibilities included statewide policy, culvert inspection training, and research oversight. In addition, she has 5 years of experience as a classroom teacher. As a student of streams, Holly seeks greater fluency in fluvial geomorphology, to speak the language of the river itself. She believes the science and practice of stream restoration can be advanced, and she wants to contribute both in developing better approaches and applying them in practical ways. Her primary research interests are sediment transport, stream stability, and aquatic ecosystem restoration. Holly comes to the river with a deeply personal land ethic. She spent many childhood years in Michigan, and as an adult she has lived in Ohio, South Carolina, and Alaska, where she met her husband. Her favorite outdoor adventures include hiking, backpacking, and hammock camping.